PS: This review site has problems with using Google Chrome so I use Microsoft Edge instead. Word to tech support. 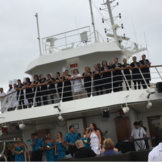 The Paul Gauguin seven night cruise was a wonderful way to see the Society Islands. A large cruise ship would be unable to dock/tender at these small ports, and the large number of passengers would overwhelm the islands. The service and staff were outstanding. The food was very good, not excellent. The entertainment was low key and okay not great. The cabin was spacious, and had a lot of storage space. The cruise was wonderful. It was personalized by each crew member. The shows were good - the crew talent show was the best! The barbeque on Taha'a was nice and relaxing. We enjoyed the food and beverages - and the variety of wines served with dinner. Overall, of all the cruise lines we've traveled with, this is the best! What can we say. We weren't sure what to expect and all our expectations were exceeded. We became close friends with 270 passengers and even better friends with all the staff. Can't say enough of how attentive and wonderful they were to us. I wish we could call each of them out by name but I can't remember all 220+ staff - suffice it to say they were all great! Best cruise, ship, staff, and food we have every experienced. Highly recommend this trip. 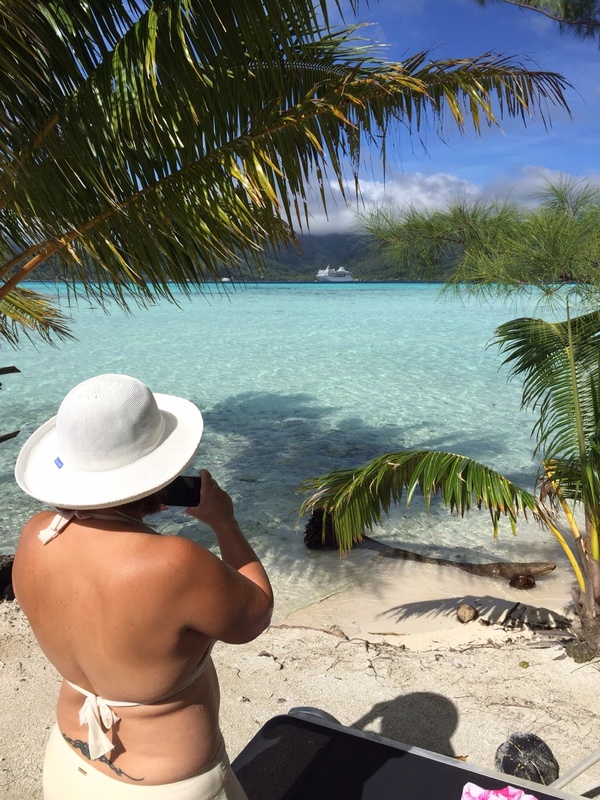 If you haven't been to French Polynesia, this 2 week cruise takes you to the popular islands ( Tahiti, Bora Bora, Moorea) and least visited (Tuamotos, Marquesas). Its a good introduction but you will want to spend time on these islands. The stateroom was very comfortable, the service was excellent and the excursions were awesome. We swam with rays and sharks in the Lagoonairium in Moorea. We didn't book this through the ship but we learned about it on trip advisor. We saved a lot on the taxi (we used Teva Taxi) and were treated to a very good tour of the island on the way there and back. We rented a waverunner for 3 hours in Bora Bora. Fantastic! This is an complete cruise package, including meals, non-premium alcohol and gratuities. Excursions were reasonably priced. Our stateroom had a problem with toilet flushing, but it was manageable. The staff are very attentive. On-board medical facilities are limited and any serious problem must be handled "on-shore." Embarkation began at 3 PM, with nowhere to wait if arriving early. We have done 18 cruises. This cruise is fantastic. All crews are so helpful.......restaurant waiters, housekeepers, concierge, tender boats, bar tenders, name them all. Art and craft classes are marvelous. This trip was amazing! From the pre cruise 3 night stay in the over the water bungalows in Bora Bora to the 10 nights on the M/S Paul Gauguin everything was perfect. The crew & service was exceptional & the smaller ship with only 332 passengers made it more personable. We just can't say enough good things about the whole experience. Highly recommend it & plan on going on more Paul Gauguin cruises! The outstanding service was the highlight of our cruise. The entire trip was coordinated with exceptional precision. We enjoyed the Gauguin hosts and hostesses that were always available and very entertaining. We really liked the waiter Ryan in the La Varanda Restaurant and bartender Francisco in La Pallett. This Paul Gauguin cruise actually exceeded our expectations and they were pretty high. The ship itself is comfortable, could use a little update in decor but you soon overlook this as the crew is amazing. They memorize your name, the bartenders remember your favorite drink if you have one, and are ready to tend to your every need. The islands visited on the cruise are breathtaking. Aitutaki was our favorite, the snorkeling there was amazing. The excursions offer a pretty good variety, our favorites were the snorkeling ones, particularly the swim with the Rays and sharks, sounds scary but it's really an amazing experience. The food is good enough that your waistline will grow a bit by the end of the cruise. It's a good thing the activities keep you moving. The passengers range from newlyweds to those celebrating 50 year anniversaries so you will meet and make new friends along the way. There were many passengers who had done the cruise before, many repeat customers which speaks well for Paul Gauguin. We may well fall into this group in a few years. Polynesia is a magical place. There is this sense of luxury at its best, in the form of staff that constantly anticipate your wishes, indulging, gracious, with contagious smiles and cheer. The 11 day PG cruise to French Polynesia was wonderful. The locations, the cruiseship, its crew and their services, the food and entertainment, were all excellent. I would highly recommend this world class cruise to anyone. This all inclusive cruise line was far above our expectations. It was great to not be nickeled and dimed constantly. Everything was handled with extreme efficiency i.e. boarding and disembarkation. We purchased the least expensive cabin which had two portholes. It was exactly the same size as the balcony units. The storage was the most generous of any ship. The bathroom was very large with a bathtub. You could actually put two people in it at the same time. The food was consistently well prepared and tasteful. Our only disappointment was the two specialty restaurants. While the service and ambience were above board, the food portions were extremely limited and small. For dinner , the Main diningroom was wonderful. For breakfast and lunch, the outside buffet could not have been any better. The menu changed daily If you choose not to do the buffet, you could order off the menu. Included in the cruise cost was free alcohol, beer, wine, sodas, In the room refrigerator, was water, sodas, and beer replenished daily. I would consider the Alcohol and wine to be mid level which was quite a good surprise. Gratuities were included. This being said the service was exceptional. From the room stewards, alll the way up to the maître d', you were treated like gold. We never saw one sourpuss. Entertainment: Michael Schapiro, the cruise director, put on two musical shows in the evening. Fabulous job ,very entertaining. There was a magician, who we did not see. Three evenings while in port, they brought on local dance troops who were wonderful. The ship had local young females and one male as hostesses (called the Gauguines) who entertained and were the most delightful. They had various Jobs throughout the ship, like greeting you at the tenders, hosting games, and singing and dancing throughout the ship. What a treasure they are to the cruise line. This was an 11 night cruise beginning in Tahiti. These tropical islands can only be described as heavenly. Our itinerary included Bora-Bora, Moorea, Huahine, Aututaki, Rarotonga, and their private island on Tahaa, where we spent the day with an island barbecue. I would give this cruise line and A+. Everyone was wonderful. The cruise director spoke English without a thick British accent, Les Gauguines were very friendly and helpful. The service provided by everyone (room stewards, waiters, maitre'd, tender operators, staff) was excellent. Enjoyed the gourmet dining, everything was very close and liked having the snorkel equipment to use the entire cruise. French Polynesia and Cook Island itinerary was excellent. Service was professional; room service w/in 10 min. Wines were high quality. Rich french food at dinner got overwhelming for 11 days. Ate frequently at the Asian influenced Grill to lighten up. Rooms were comfortable. Staff curt in the French boutique restaurant. Evening entertainment below par; dated and often amateurish. Travel desk not open @ independent touring outside of excursions, although excursions were high quality and fairly priced. Did the pre sail tour to Moorea and it was spectacular.A great way to tour the islands.